In a few weeks I’m heading to SNAP!, a crafts and home DIY blog conference in Salt Lake City. I’m pretty excited because I had an amazing time at Haven last year. Blog conferences are downright fun. You’re with your people. They get you, and you get them. Plus, you learn a lot. Around this time is when bloggers start to freak out a little about what to take to a blog conference, especially newbies. Do I take my laptop? Will I need my DSLR? What will I wear?! Rest assured, I’m here to clue you in on what to take to a blog conference. Now, I’m not an expert because I’ve only been to one conference, but I quickly learned what to bring and what not to bring. 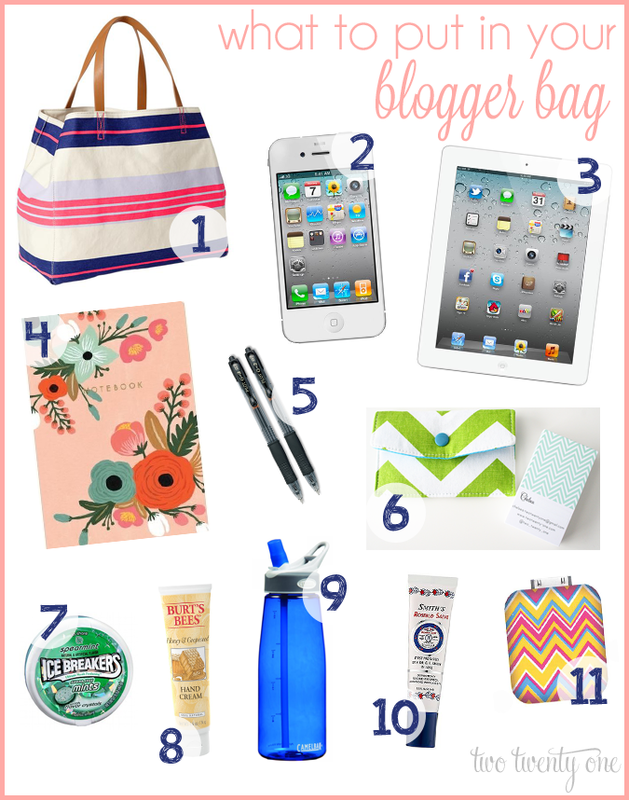 So let’s start with your blogger bag. It’s the bag you’ll carry with you during the conference. In order to have a blogger bag you’ll need a bag. A nice sized tote is a good choice. Feel free to splurge and get a smaller bag to curtail the little stuff you’ll put in the bag. This is kind of a no brainer, but you’ll want your smartphone. You’re going to want to tweet people and post pics of you and your favorite bloggers on Instagram. You’re also going to want to use your smartphone to take photos. An iPad is great for taking notes in breakout sessions, especially if you prefer typing over writing. You’ll want a notebook for notes (obviously), especially if you don’t bring a tablet. I used my notebook and iPad at Haven last year. Bring more than one pen. You’re bound to lose one. Plus it’s nice to have a couple to lend people who forgot or lost theirs. You’re at a blog conference to network so it’s kind of silly to show up without business cards. (Read about mine here.) And you don’t want to fumble around your bag for your cards when someone asks for one, so invest in a business card holder. There are plenty on Etsy. Who wants to have rank breath when they meet their blog idol? No one. That’s who. Sometimes you hug people, sometimes you shake hands. Which now reminds me that I should have put hand sanitizer on this list. Anyway, keep your hands moisturized for all the hand shaking with some lotion. Wet your whistle. You’ll be talking a lot. Sometimes you hug people, sometimes you kiss people. Hah. Just kidding. Keep your smackers looking pretty and hydrated with some lip gloss. Your phone battery will die. I promise this will happen to you. Save yourself a headache and invest in a smartphone backup battery. I lugged my DSLR all the way to Haven to not use it. I took photos with my iPhone or if I was in a photo taken with a DSLR I’d ask the DSLR’s owner if she could email me the pic. Worked out fine for me. I don’t think it’s absolutely necessary to bring your laptop. I didn’t take one to Haven since I had an iPad. You won’t have time to work on blog posts or edit photos at a blog conference. Leaving your laptop at home means one less thing you have to drag around the airport with you. To put the bodies in. Just kidding. There’s typically a fair amount of swag at blog conferences. If you’re flying, I recommend bringing along a durable duffel bag in your checked bag. When the conference is over, you can put your dirty clothes in the duffel bag and your swag in your suitcase. This way you’re able to take your swag home with you. Trust me, it’s no fun leaving swag behind. Since you’re only flying one way, the checked duffel bag should only cost you an additional $20-$25 to get it home. Darn airlines making us pay for checked bags nowadays. Your media kit is a piece of paper that tells all about you and your blog. Some things you’ll find on a media kit are: type of blog, history of the blog, photo of the author, about the author, statistics, some blog photos, advertising policy, brands the author has worked with, etc. Media kits come in handy when meeting and talking with brand representatives. If you’re going to have 3+ roommates you may want to consider bringing a power strip so there will be enough outlets to charge all of your electronics. However, I stayed with two other girls at Haven, and I never used the one I brought because there were enough outlets for the three of us. Some bloggers will bring little gifts for their roommates as a preemptive apology for passing gas or hogging the bathroom mirror. Just kidding. Kind of. It doesn’t have to be anything fancy. It could be a candle, their favorite candy, or some cute stationary. If this gives you anxiety (will my roommates bring me a gift and I’m the jerk who shows up empty handed?) talk to your roommates about it beforehand and tell them you don’t expect a gift or settle on everyone bringing a bag of dried fruit candy to share. Or you could take it to the next level and do a white elephant of sorts. If you’re going to be spending a lot of time flying or hanging out in airports between flights I recommend bringing your e-reader along. You won’t need it during the conference. Unless you’re totally anti-social. But that won’t happen because you’ll be with your people, remember? Now, because I’m the nicest person in the world, I created a blog conference packing checklist for you. Oh, stop it. You don’t have to tell me how awesome I am. I added the lines next to the clothing and accessories so you can specifically list which pieces of clothing you want to bring (ex: blue dress, jean jacket, emerald earrings). Do you have to bring everything on the checklist? No. Decide what you want to bring based on what you think your needs are. If you won’t use your laptop, don’t bring it. But please bring your deodorant. You’ll definitely need that. Will I see you at SNAP? Any blog conference tips for newbies? Is there something you bring to conference that I left out? I’m sharing this at the following parties: Home Stories A to Z, Tatertots and Jello, House of Hepworths, Liz Marie Blog, The Shabby Nest, Positively Splendid, Whipperberry, Classy Clutter, Today’s Creative Blog, Uncommon Designs, Craftberry Bush, Design, Dining, & Diapers, Crafty Scrappy Happy, Snap Creativity, and Serenity Now. Chelsea, great checklist…hoping to attend a blog conference in the next year–this is a great checklist! Have fun at SNAP! I did not pass gas……ok maybe once…darn. 🙂 Great list! I’m not going to SNAP but I am sure it will be a blast! Chelsea, this is such a great list that I’m going to pin for reference for Haven. It’s like 4 months away, I don’t even have a ticket yet (attempting to buy one off someone), and I’m worrying about what to pack/wear/dowhenImeetmyidols. I may not even get to go and I’m worrying about this stuff, lol. Blog conferences are scary! Great list, Chelsea! I’m hoping I’ll need it someday! Have fun at SNAP! I’ll save this away for a time when my real job doesn’t interfere with my blog life. Lame. What good tips! The idea of a blogging conference really makes me excited. I hope I can use this list some day! This is awesome! I’m going to Haven, and already worrying about what I need to bring. Thanks for the tips! Have fun at SNAP! I like that checklist! And if I ever go to a blogger conference, I will remember this post! Awesome list! This makes me wish I was going to a conference this year! Oh well, next year for sure! Awesome list, Chelsea! I’ve never attended a blog conference before but I hope to attend a few next year and this will definitely come in handy then! Great list! Printing and pinning it! Yay! Can’t wait to meet you at SNAP! This is my first year and I am really excited. Just got home from Craftcation in the wee hours of this morning! Ooh, so helpful! I’m headed to SNAP in a couple weeks and needed some guidance on what to pack. And good call on getting my roomate something…. hahahaha!!! Just kidding roomie 😉 PINNING! I’m not a blogger, but anytime I get together with a group of friends at a hotel I like to have a wine opener just in case! SNAP is going to be my first blog conference, and I’m so excited! Thanks for the tips on mints and lotion, totally would have forgot those! And chargers too! I know you said an extra battery (so smart for during the day) but I almost always forget to pack chargers and then can’t even charge my stuff at night! Dang it, I keep hearing about media kits!! I don’t waaaaannnnnnaaaa make one!! How about you make one and show us? Thanks for the great list! This is so neat! I’ve never been to a blog conference, but I really want to go. I guess I’ve been such a “shy” blogger in the past, but now I realize how silly that is! I’m pinning this for sure. Thanks! LOVE THIS! I am so excited to be going to SNAP! this year. 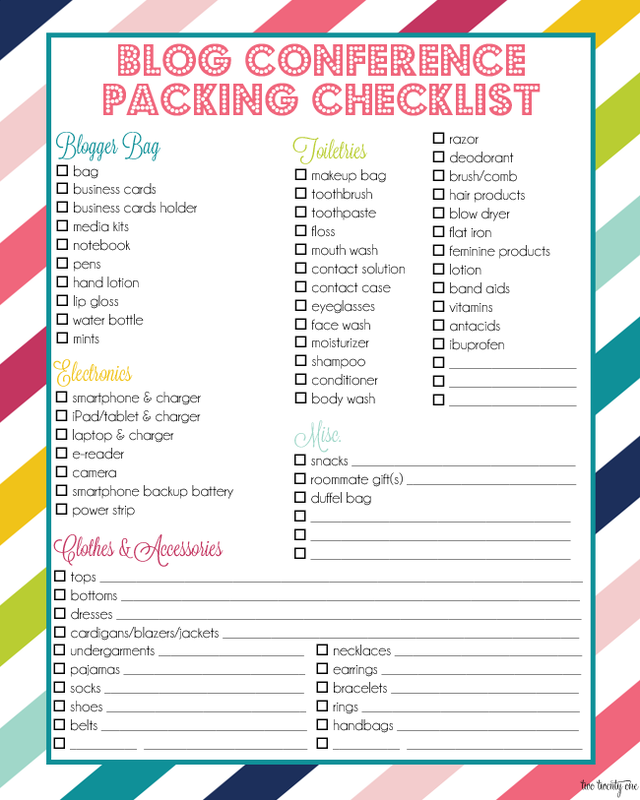 This checklist is totally going to save me a lot of pain when it comes to packing. I hope you will consider linking it up to the Pinworthy Projects Party over at my blog, Just Us Four. I’m going to Haven in August and have already started to stress over what to take. Your list is very helpful for planning what I’ll need. Hope to meet you there! This is SO helpfu! As a (very) novice blogger, I hope to attend a blog conference ASAP and look forward to packing according to your list! Thank you!!! This sure is helpful! I’m not going, but one day I hope to make a conference. I’ll have to save this for the future! Saw you sharing at Serenity Now. I love the duffle bag idea! I will be doing that! The hard part is to fit my clothes in a 21 inch carry on! See you in 9 days! Hi Chelsea! Great list! My first blog conference was Haven last year. I think your list is great! I did like having my pc with me at year though since I prefer to blog from it instead my my iPad. Great job! See you at Haven! I love EVERYTHING about this post Chelsea! My hubby was like, “What are you laughing at?? ?” Thanks for the checklist and see ya in a couple weeks! Thank you a million times over! Just ordered the battery recharger and I think it will save me at Haven this year. Also rethinking the dslr and laptop. LOVE this list! Just pinned to the Pinterest board for MomCom 2014 (www.momcomlife.com) for our attendees. I’m going to use it myself for a conference I’m going to in a couple of weeks, too! Thanks for the great checklist and ideas! Nothing worse than getting to a conference and realizing you brought to much, or forgot something critical. Thanks for this Chelsea! Heading to BYB2014 and this is just the help I needed! List of objectives: Questions you need answered. Pictures you need with potential “product partners” for promotion purposes. Pictures with owners of products you’re an affiliate with. Blog objectives. Sponsors you need to meet with. Make every conference a business builder. I just found out about Snap and am thinking about going this year. It would be my first blog conference!